We wrote about Bitcoin open source project when it was officially launched sometime in 2010. We did a followup article when the value of one Bitcoin hit $1 USD. And somehow I managed not to buy any during those early days (it was not easy acquiring these elusive "internet money" back then, being outside of US and EU didn't help either, I guess). But even then, I'm happy that Bitcoin is proving all its naysayers wrong. We saw it coming and we were able to inform our readers about Bitcoin before it was cool. The value of Bitcoin just went past an astronomical $1000 mark!! Nobody in their wildest of imaginations would have thought of sky high valuations like that for Bitcoin within such a short period of time. Bitcoin started off as a small alternative digital currency project way back in 2010. This open source project aimed at creating an eco system where users with just a computer and an internet connection would be able to send money across the world without any middle men (read Banks) interfering. And unlike major fiat currencies like USD or Euro, Bitcoin will be deflationary by design, and only 21 million of them will ever be "mined". You can't "print" as much as you want like in traditional currencies. And Bitcoins cannot be duplicated either. Bitcoin was a revolutionary idea back then and at the current rate of adoption, it can soon become something slightly more valuable than an idea. 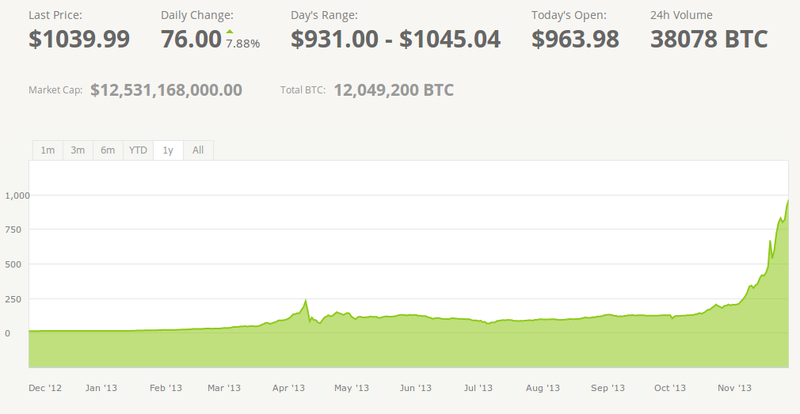 After quite a number of ups and downs, Bitcoin has just crossed the magic $1000 USD mark yesterday. It is already past $1100 on Bitcoinity, but a more reliable metric would be that of Bitstamp, where the value of one Bitcoin is still hovering around $1050. To commemorate the occasion, we have decided to include a "Donate with Bitcoin" option to our blog. We have been asked to include the "Paypal donate" button by a number of our well-wishers. But I was never a big fan of Paypal. Now that Bitcoin is coming into its own, I think it's high time we incorporate Bitcoin to our blog. So, from now on, if you like what we do here and want to contribute, use the QR code on the right side bar. Thanks for reading.